Copywork can seem deceptively simple. Give your child a sentence or two and have them copy it. It can seem like pointless busy work, but the benefits are tremendous. First, copywork takes the place of penmanship practice. Once a child learns how to write their letters comfortably, they are ready to start simple copywork. Start with very short sentences and have them copy it in the best handwriting. It is important that they give their best effort. If you find them struggling, give them less to copy. In the beginning, it’s ok if they only do one word per sitting as long as that one word is in their best handwriting. You can gradually increase the length of the model as they become more and more comfortable. However – it is important to take their age into consideration. A typical 6 year old isn’t going to be able to copy a paragraph worth of writing with their best effort. Why do copywork at all? Copying models of good writing teaches your child what good writing looks like. Many of the world greatest writers learned how to write through copywork. Jack London would copy out his favorite books in order to teach himself good writing; Benjamin Franklin would copy or outline essays and then try to recreate them on his own to see if he could write them better. By copying out good writing, your child learns what good writing looks and feels like, thereby improving their own writing. 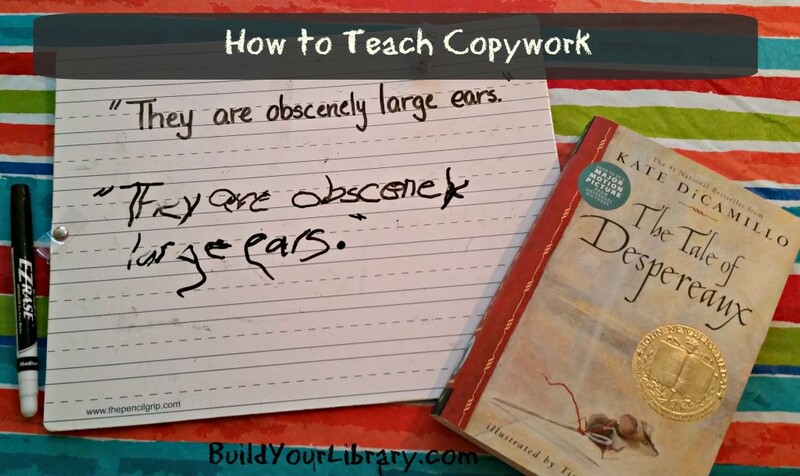 In the elementary grade levels, copywork can even take the place of formal language arts curriculum. You can use copywork to teach mechanics, such as proper punctuation and capitalization, as well as spelling, vocabulary, careful handwriting and parts of speech. You can teach them different writing techniques, such as how to write dialogue, different literary devices (metaphors, alliteration, etc.) – there are so many different ways that it can help nurture your child’s writing abilities. Just choose one thing at a time to focus on. For a beginning 6 year old, you might focus on beginning with a capital letter and ending punctuation. Your 9 or 10 year old is ready to learn about parts of speech or how to format dialogue. Focus on just one thing at a time, spending as much or as little time as necessary until they understand. How do you choose selections to copy? If you want to teach good writing to your children, then you need to provide them with beautiful writing to copy. Choose passages from well-written books, poetry, songs, etc. When you use a Build Your Library grade level program or unit study, your copy work passages are chosen for you from the literature you and your child will be reading. You can even use copywork to aid in memory work – I find that when we use our memory work as copywork it helps them to learn it quicker because they are using more of their senses – mind, hands, eyes, etc. So what does copywork look like in a typical homeschool environment? For a young child, I write their copywork very neatly on the top of a sheet of their writing paper. I read it over with them, pointing out anything of note. Then I have them copy it out in their best writing. If your child is a dawdler, you may wish to set a timer. It should take no longer than 10 – 15 minutes to complete. For an older child, I like to write out their copywork on a white board. I recommend doing copywork three days per week. Remember, copywork isn’t only for children! We can keep our own “Commonplace Books” where we can jot down quotes from our own readings that strike our fancy. Not only is this good for our own self-education, it’s encouraging for our children to see that we are learning too. My kids are loving the copywork from Build Your Library. If they peek ahead in my planner, they listen to hear that phrase in the reading. I have been typing out the copywork for them and just putting it in a binder for them along with lined paper.